Now that the summer heat is finally catching up with us in Texas (it’s been pretty mild so far this summer), it’s time to really shed any extra fabric. You simply don’t want to wear more than you have to when it gets this hot! 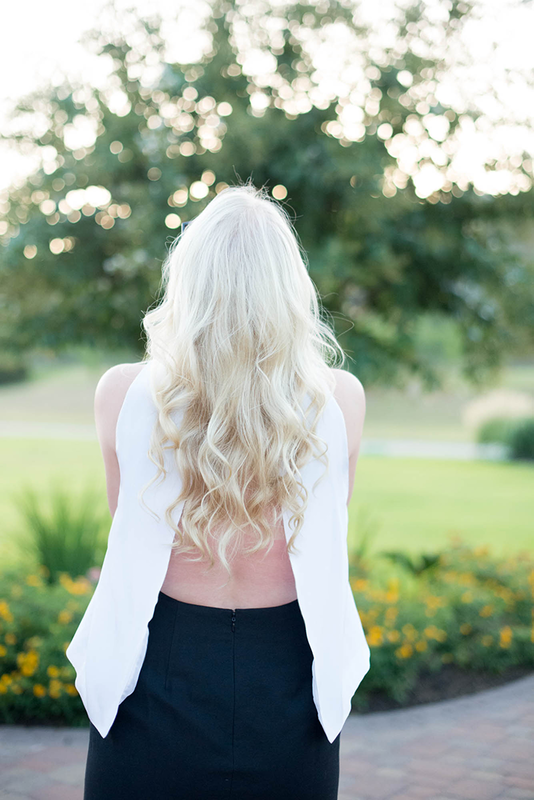 That’s why this open-back Tibi dress is ideal for a night out in the hotter months. The fun beading screams summer, but it’s the airy open-back silhouette that makes even the spiciest temps bearable. In addition to this dress, there are a bunch of gorgeous items on sale at Tibi right now! This colorblock dress would be perfect for a more casual summer wedding, don’t you think? This poplin frock is a classic, but with a faux-crop top it’s fashion forward too! I’m dying for this pair of embellished + heeled sandals. So fun! If you’re more of a basic gal, these flat, strappy sandals are amazing. Lastly, this silk pleated maxi skirt is a summer-to-fall essential. As far as new fall arrivals go, Tibi’s really killing it there too. This felted wool cape is a layering piece I’m currently coveting. The light peplum on this top is so pretty and feminine, but I also love the edgy look of this asymmetrical skirt. As far as accessories go, this evergreen plaid scarf is an obvious choice and this pair of heels is to die for! You look stunning, love this dress on you. 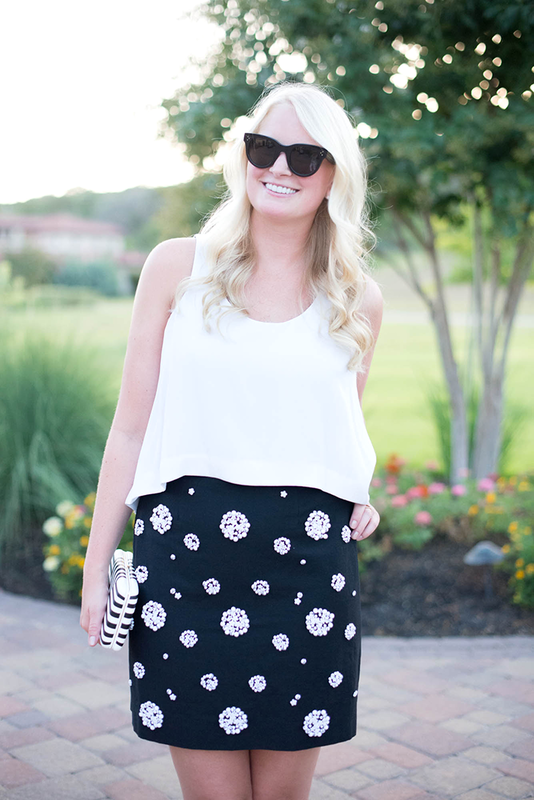 This skirt is so chic. Love this look on you! 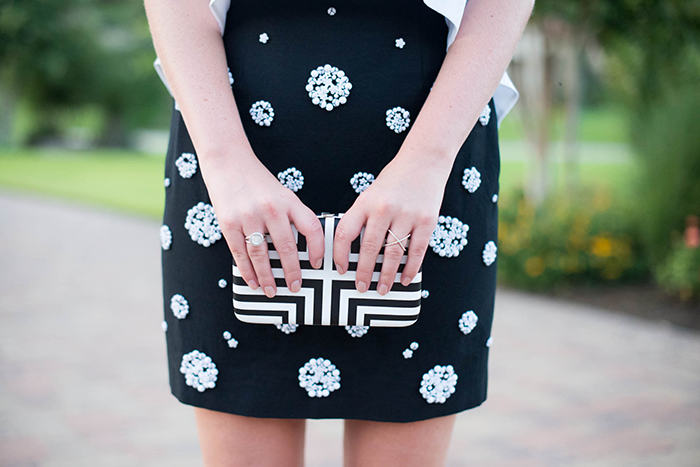 At first glance, I thought this was two pieces – love the embellished skirt! You look gorgeous!! What a cute dress! I thought it was a skirt and top. Pretty! I love black and white and have been wearing it repeatedly this summer. Love the black & white! The open back is such a nice detail. Beautiful look head to toe. What a fun top!!! Love the surprise open back! What a lovely dress with such a fun back! How beautiful! I have been eyeing that wonderful tibi dress but dont have to occasion to wear it. I love the relaxed top and then the fun beaded details on the bottom! Such a great dress! Everyone at rS was talking about how much we love your dress when we spotted it on Instagram yesterday!! The embellished details and open back are AMAZING! I am in love with this look and the beaded details. Also, your hair is looking beautiful! Your hair,so pretty! Love the beaded detail on that skirt, so pretty. This dress is beautiful! I love the detailing and the open back! That clutch is amazing! Love this look. It would be perfect for some of the dressier cocktail parties I have coming up! I’m also really excited for fall now after checking out your early fall picks. I love that cape. I thought it was two pieces at first. This dress is so pretty and perfect for date night! I love the open back! Obsessed with this skirt! So versatile. awesome dress! and the back is AMAZING! and i can’t believe Texas is having a mild summer… of course, after I move away! This is such a beautiful look. I really love the detailing on that skirt of yours! A classic black and white combo is perpetually chic. I love the open back and the way you mixed up the prints to keep this ensemble modern and fresh! outfit trickster! haha, thought this was two pieces. gorgeous, and love the embellishment. So pretty! Merritt, this could quite possibly be one of my favorite outfits of yours to date! Absolutely stunning and perfect in every way. That is such an adorable skirt! And I just realized it’s a dress … now I REALLY love it! You look stunning…I do have one personal question. What are you doing for an undergarment? I’m a 36 DDD and I refuse to go without a bra. Let me in on your secret. Your clutch is so cute! this look is so chic! i love those glasses! love the all black and white! This top is gorgeous, you hair looks amazing too! I love the mix of highs and lows w/ Tibi and Target. Actually, on second thought, I love everything about this look. Perfection, Merritt! Adore the embellishment on the skirt! And black + white is always a chic combination! That dress is to die for! You look stunning, girlfriend! Hope you are well.